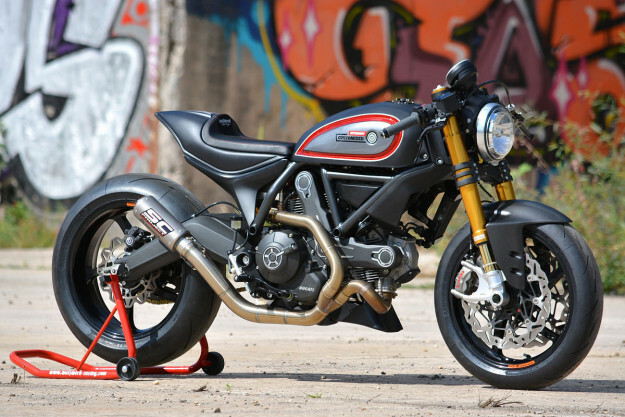 Can you believe it’s almost a year since Ducati threw the wraps off the new Scrambler? 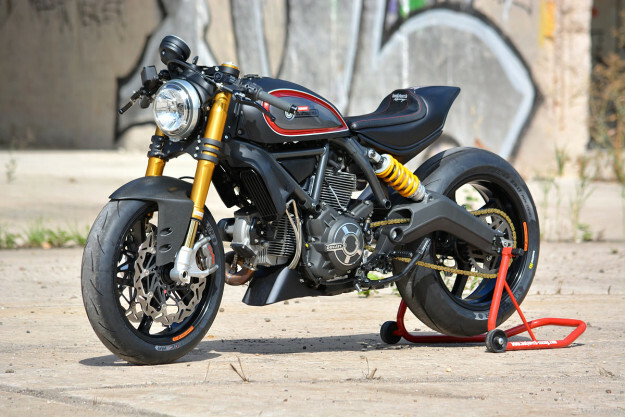 Since then, it’s become Ducati’s most popular bike—outselling the Multistrada by two to one. 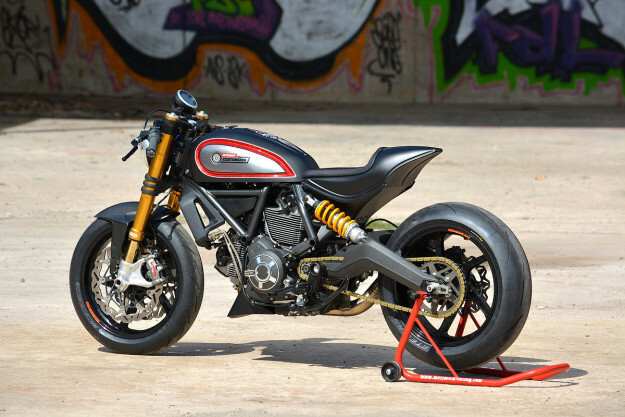 The Scrambler was revealed at the Intermot show in Cologne, Germany. The next Intermot show will be 2016, and in a neat twist of fate, the headline bike will once again be a Scrambler—this very rapid custom from WalzWerk Racing. The Scrambler has been praised for its big value and fun factor, but some testers have wished for a little more grunt and better handling. And that’s the approach taken here. The bike belongs to Intermot VP Christoph Werner, who gave it to legendary builder Marcus Walz for a high-performance overhaul. Walz straight away put the motor on the bench, stripped it down and rebuilt it. It’s now got ported heads, new pistons, rods, valves and cams—and a balanced crank. 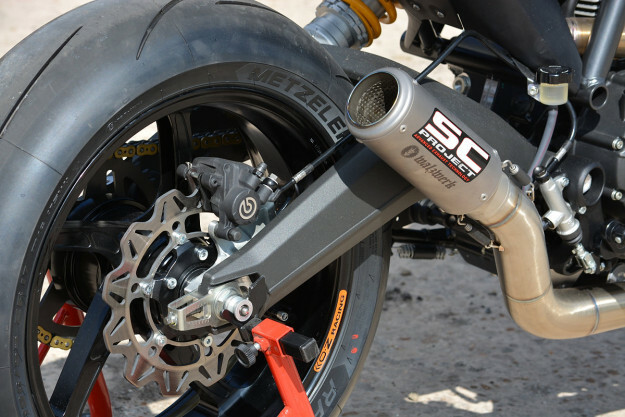 MotoGP specialists SC-Project helped design a new exhaust system, terminated with a genuine MotoGP silencer lifted from Aleix Espagaro’s bike. 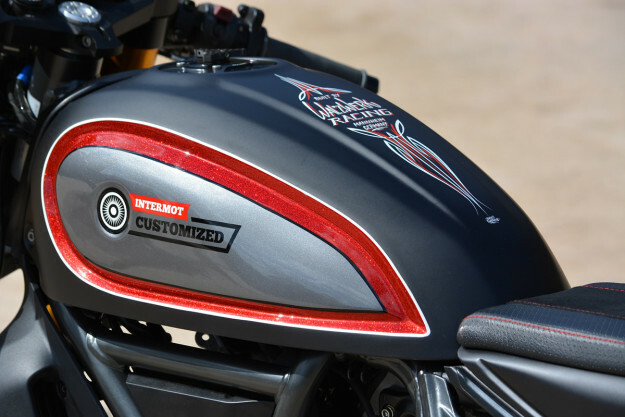 “The Scrambler now pumps out around 100hp on the dyno,” says Walz, “which is not bad—we kept the stock 803cc capacity.” The power-to-weight ratio is better than a Honda CBR600RR. For the suspension, Walz turned to another motorsport specialist, Öhlins. He’s modified a set of Panigale 1199R forks, shortening them to maintain the correct geometry and installing one-off internals. The rear shock is also custom: it’s a mix of components from over 12 different Öhlins shocks, to make it fit in the tight confines of the Scrambler rear end. The swingarm is CNC-machined around the shock mounts, to give the shock enough space to move freely. Power hits the back wheel via a gold D.I.D 520 racing chain, a racing sprocket and a titanium chainwheel. 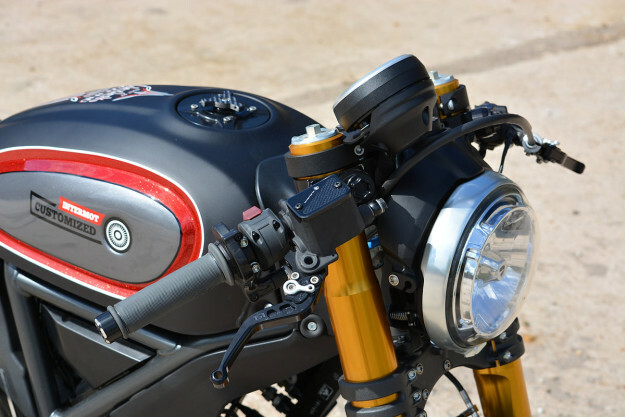 The minimalist 17-inch rims are from OZ Racing, originally designed to fit the Panigale 899. 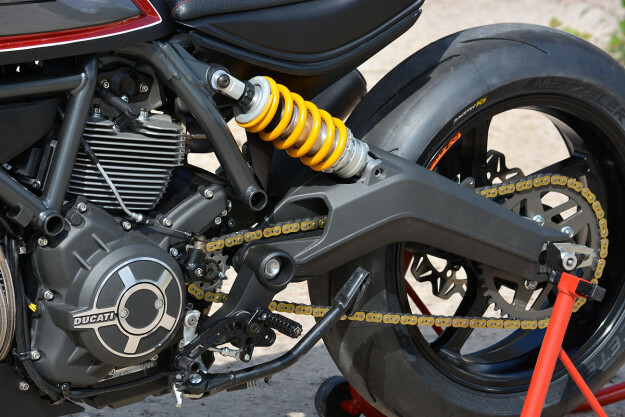 To adapt them to the Scrambler, Walz has employed new spacers, bearings and brake disc carriers. 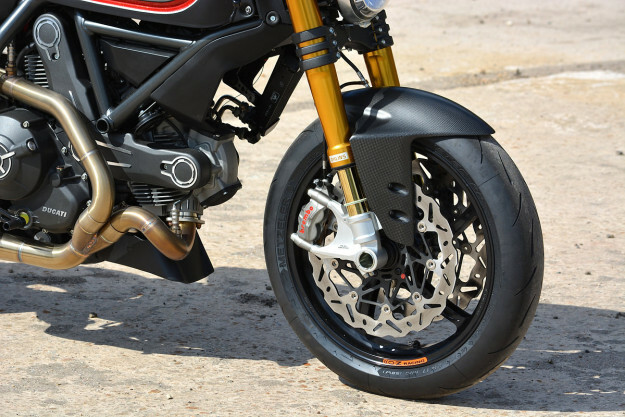 Stopping duties are now handled by Brembo monoblocs at the front, hooked up to wave rotors from the Italian company Braking. An uprated EBC aluminum rotor on the back wheel is good enough to stop the 165kg weight of this bike. Tires are Metzeler’s Racetec RR street-legal racing rubber: 120/70ZR17 at the front and 190/55ZR17 at the rear. To suit the sportier nature of the bike, Walz has changed the ergonomics with adjustable clip-ons from Gilles and DucaBike footpegs. 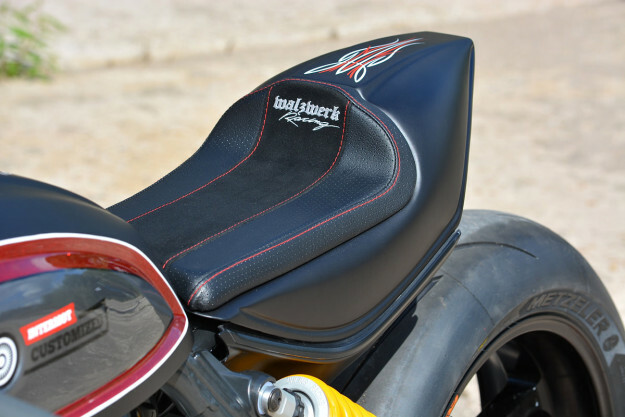 The new seat and tail unit is hand-fabricated from sheet aluminum, but the gas tank is a heavy modified standard item. The paint comes from Porsche: Basalt black in a matte finish, and Agate Grey in gloss. Plus a touch of candy apple metalflake. 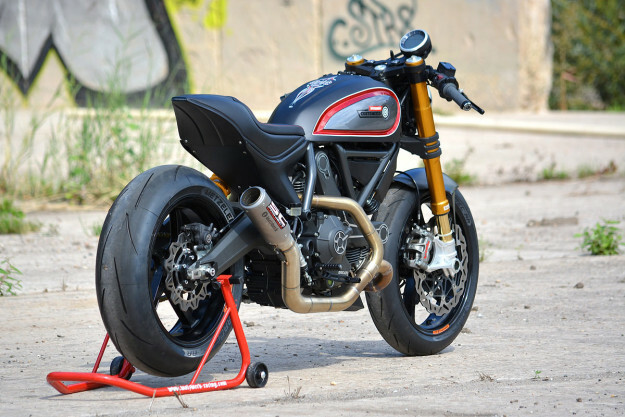 It’s a stunning build, but is it a Scrambler any more? Rather than amplify the charms of the stock bike, Walz has steered it in a new and very interesting direction.